Peterborough Sports: The envy of Barcelona and Bayern? Seventeen wins from 17 league matches at the start of a campaign is a record which would surely be the envy of Barcelona, Bayern Munich - or even Leicester City. However, boasting that perfect start is in fact United Counties Football League Division One side Peterborough Sports - the only team in England's top 10 divisions with a 100% league record going into Christmas. That's a start better than the country's top four divisions' all-time record of 14 consecutive victories and, with a goal difference of +71, they sit 10 points clear of second-placed Northampton ON Chenecks with two games in hand. 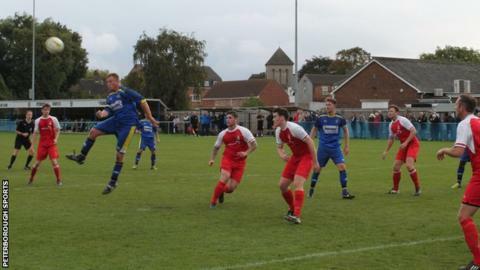 But it almost came to a dramatic end on Saturday against mid-table Raunds Town. Chairman Tommy Cooper told BBC Sport: "We were 1-0 down at half-time and launched wave after wave of attack but it looked like it was going to be one of those days where we didn't score. "We finally managed to scramble in an equaliser with 20 minutes to go but it didn't look likely we'd win the game. But our right-back (Oliver Medwynter), who'd scored the first goal, popped up with a fantastic header in the 90th minute - although they almost equalised when we were still celebrating. "We had it in our minds 'that's it, we're 2-1 up now'. Everybody switched off and they should have scored." Cooper, who hopes to take the club to the Southern League Premier Division, said that sponsorship was up 130% on the last campaign and matchday income had already doubled last season's total. But, after a start to the season which included two 9-0 league victories, the chairman said the run was now "kind of a chain around the neck" with no player wanting to be the one to make the mistake that leads to the sequence ending. "As Raunds showed on Saturday, every team wants to be the one that downs our colours and ends our run," added Cooper. "The pitches at our level are not the best, and mid-winter away from home, they're all going to be really difficult. "Earlier in the season we were winning 5-0 , 6-0, 7-0 and 9-0 on a couple of occasions, but just recently it's been tougher for us to blow teams away." While things may be looking rosy for Peterborough Sports, a few teams have had seasons to forget so far. None more so than Saint Francis Rangers who sit bottom of the Southern Combination League Premier. The Sussex-based side also boast a 100% record - 20 games, 20 losses and a goal difference of minus 135 having scored just twice and conceded 137 - including a 10-1 thumping by Newhaven on Saturday. Faring slightly better defensively, with a goal difference of minus 99, are Southern League Division One South & West side Bashley. The Hampshire club have lost all 22 of their matches this campaign and are 16 points adrift at the bottom of the table. Life has not got much better for eighth-tier Derbyshire side New Mills since they were described as possibly 'the worst team in English football' last month. They are still at the foot of the Northern Premier League Division One North with 19 straight losses and found themselves 3-0 down in the opening 17 minutes at Prescot Cables at the weekend before eventually losing 5-2.